Motherwell manager Ian Baraclough warned Partick Thistle they are not yet out of danger despite watching his side go down to a 2-0 defeat at Firhill. 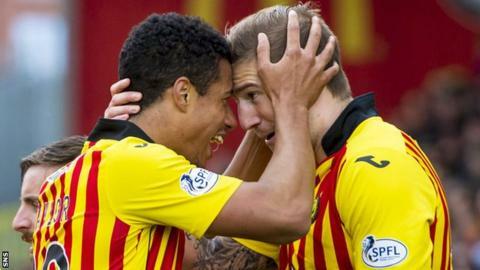 Lyle Taylor's second-half double ensured the Steelmen remained second bottom, and put a seven-point gap between Thistle and Motherwell . Stuart Carswell was also sent off for the visitors, who trail Ross County by three points, but are 10 clear of St Mirren. "They've managed to get a few points away from us - Partick Thistle - but we've got to make sure we drag them down again," Baraclough told BBC Scotland. "[Ninth-place] Kilmarnock will still be in it and ourselves, St Mirren, Ross County." Motherwell went into the game having won three on the bounce, but struggled in front of a healthy away support. "I thought we were at it in the first half, we asked questions of them, and it was just a matter of time for me," said Baraclough. "But in the second half we couldn't get a foothold in the game. The game fizzled out for me without much of a spark. "The goals - looking at them, they're both offside. That's something where you look for a little bit of help from the officials, but they haven't seen it so it's gone against us. "Even at 2-0 down you're still in the game, but we almost accepted it. There was a lack of drive and belief maybe that we were going to get the game back in our favour. "It's a set-back. It's the first game in six or seven where there hasn't been that spark. We've chosen the wrong game to have that lull. "Five massive games [remaining], we'll get ourselves ready for those and we'll come back with renewed vigour." Partick Thistle manager Alan Archibald said the result relieves a bit of pressure on his side as they bid to stay away from the play-off spot. "I didn't think it was a great spectacle, especially first half," said Archibald. "Motherwell probably had the better of the play. The surface and the wind didn't make for pretty football in the first half. "He [Lyle Taylor] missed a lot of chances last week and a few people had a go at him, but we knew he would come back to score a couple of goals for us, which he did today. "It lets us relax a bit, and gives us a cushion. It also takes us above Kilmarnock though I know they've got a couple of games in hand. "It's a good position to be in at the moment."